Designed to handle all conventional cars, SUVs, and light duty trucks. Our self service recreational equipment bay is OVERSIZED to handle larger boats, trailers and RVs. Wash services include extra high pressure, a catwalk to access taller vehicles, double wands and brushes. 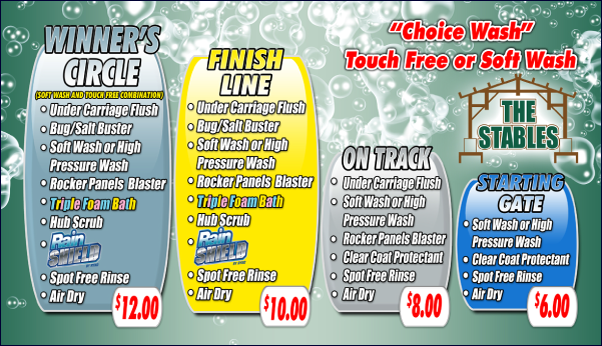 Vacuum your car, truck, RV or SUV on site too! All of our equipment accepts MC, VISA, Discover, and AMEX as well as our own Stables Discount Wash Card and Wash Coupons.